You love your home – that’s why you bought it. But lately it’s been feeling a little too snug and you’re dreaming of some extra space. We’ve been there, but the solution doesn’t have to involve moving! So delete that estate agent’s number, close that property site and take a look at some of these incredibly creative things you can do with a home extension. 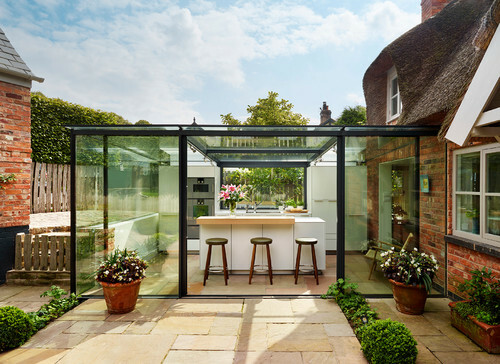 This glass box extension is the epitome of modernist style – we love the idea of creating a bright, spacious kitchen like this one. Just imagine the sunrise surrounding you as you cook breakfast, or watching the snow fall as you keep toasty with a hot chocolate. Double glazing provides protection from the elements, and sliding doors ensure it doesn’t get too hot in summer. The only limit to what you can achieve with your house extension is your imagination – as proved by this house which looks as though it could appear in an abstract art gallery! 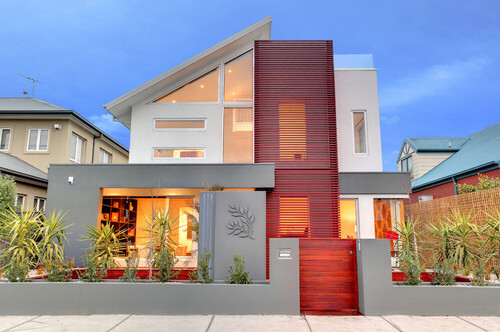 The differing dimensions, contrasting textures and sloping roof are guaranteed to stand out from the neighbours! Winter is here in London, and it might feel like we’ll never see the sun again, but have faith! Summer will be back and if it’s anything like the one we just had, you’ll want an amazing outdoor home space to enjoy it in. This open plan extension is perfect for the host with the most – just imagine the parties you could throw in that garden! 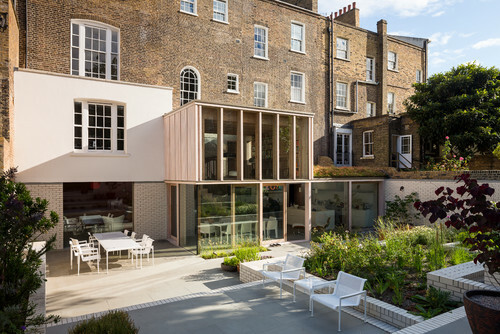 If there’s been one stand-out home extension trend of 2018, this is it. Black wood panelling is seriously in vogue right now! 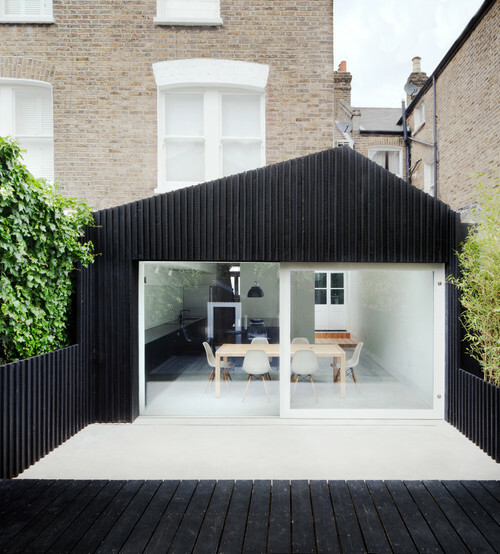 The dark colour makes a dramatic statement, especially when contrasted against the property. Monochrome is always a winner; the clean lines and stark polarity of this extension help it to achieve a minimalist style that won’t be going out of fashion any time soon. 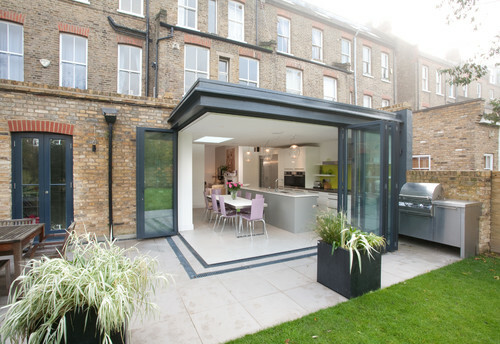 Why not utilise the space on top of a flat-roofed extension and create your own outdoor terrace? Fill it with patio furniture and you’ve got the ideal spot to while away summer days and warm nights, particularly if you’re short on garden space. 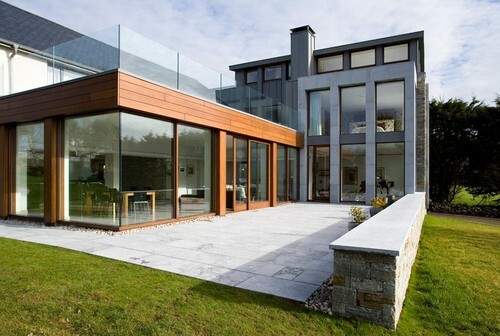 The glass boundary around the roof of this extension provides security whilst looking super stylish! You might be used to seeing straight lines and structures on British properties, but why play by the rules? 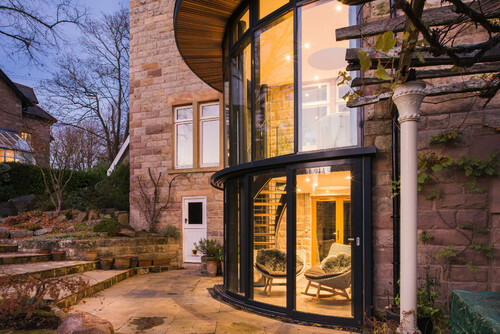 A curved extension looks absolutely show-stopping and is a great way of utilising awkward spaces where a traditional extension might not work. Sometimes you just can’t beat the classics. Traditional style has a way of coming back around so why not take it back to basics with classic brickwork on your house extension? 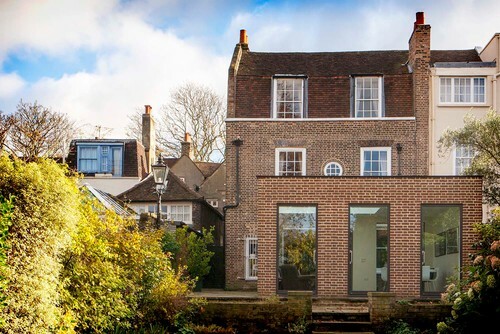 But it’s always good to get experimental – these triple doors give this extension an unusual twist that looks striking from the outside. If you’ve decided to extend your home, why not go all out? 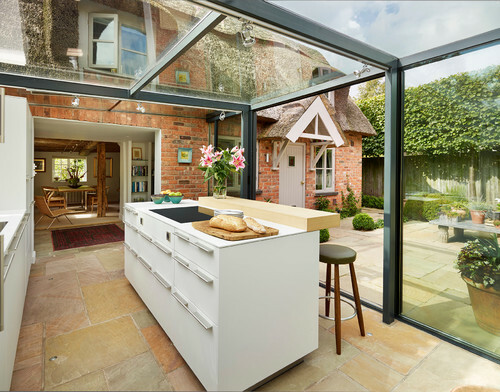 Create double the space with a double storey extension. Embrace the use of natural light by adding full length vertical windows like this one, for a light, airy effect across both floors. 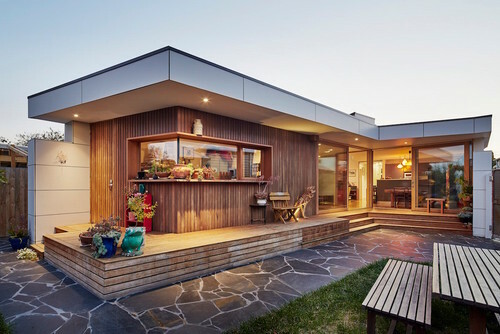 The home extension for the perfectionist who likes things neat, smooth and just right. 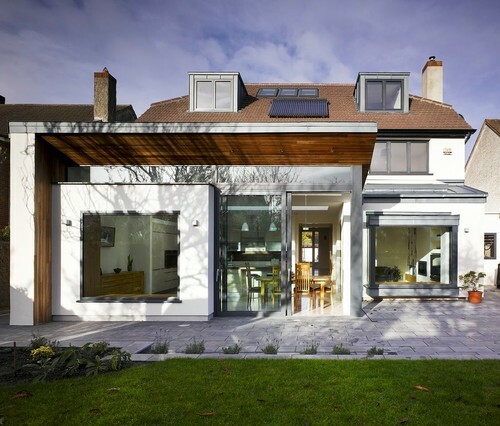 Aside from looking fabulous, rendering your house extension has all kinds of added benefits; like protecting your brickwork from wind and rain and providing insulation, which means keeping energy bills down. Consider mixing up colours for a wacky, eye-catching design. A modern take on countryside living. Classic wood panelling is a great way to achieve a rustic look, even on a city home. 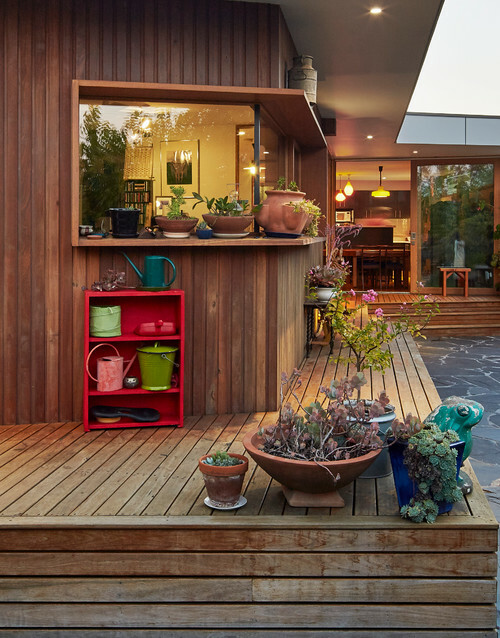 We love this eccentric wooden extension and decking, especially the quirky garden window and accessories. Loving these ideas? Turn that envy into inspo – book your home extension consultation today.